Ain't got that much for you this Wacky Wednesday. Except a bunch of musical chimps. Let's start with a 1940s newsreel from Castle Films. This Post cereal commercial isn't nearly as cool as "Red Rose Tea." But it's still chimps. 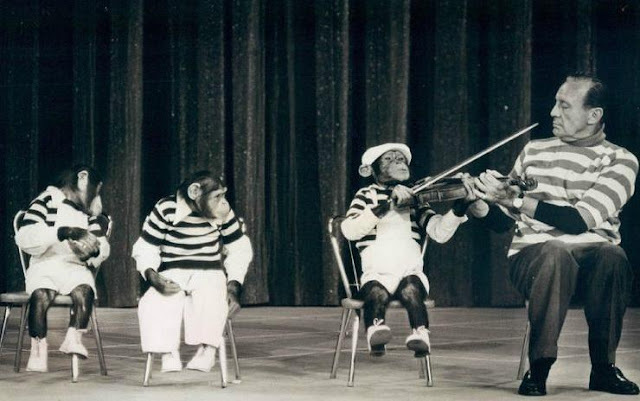 In the '70s, Lancelot Link & The Evolution Revolution was the hippest chimp band going. But let's go back to an earlier era of tlevision when the Nairobi Trio played The Ernie Kovacs Show. Technically, they were gorillas, but I think they fit in here.